“Lament of the Three Marys”, by Iarla Ó Lionáird. (If you enjoy this, I heartily recommend his solo album The Seven Steps to Mercy (Iarla is also a member of the Afro Celt Sound System, fusing modern dance rhythms (trip-hop, techno, etc.) with traditional Irish (Celtic) and West African music). Friday, January 22, 2010 \AM\.\Fri\. Parishioners and friends are helping history arrive at the Galveston-Houston Co-Cathedral of the Sacred Heart. The arrival of the long awaited Pasi Organ Builders Opus 19 organ marks the commencement of its installation. 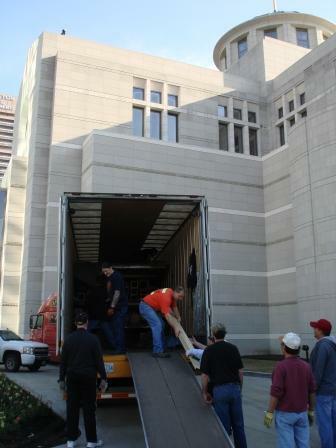 This past Monday morning, the first of two large moving trucks rode into downtown Houston and pulled onto the driveway of the Co-Cathedral. 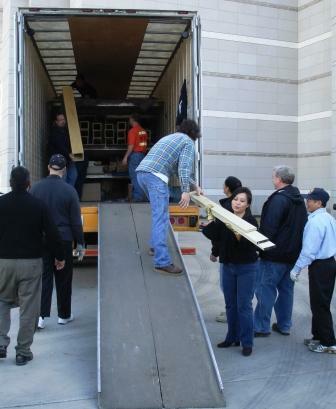 Soon thereafter, members of the parish and friends began offloading thousands of pounds of handmade organ components into the magnificent Co-Cathedral of the Sacred Heart of the Archdiocese of Galveston Houston. 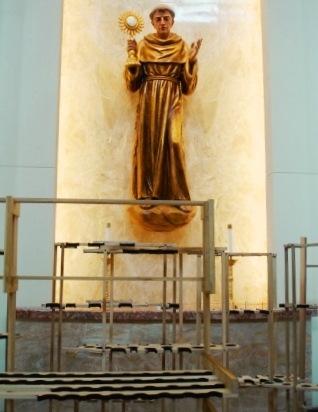 Since its consecration and Mass of Dedication on April 2, 2008, the Co-Cathedral community has been worshiping accompanied by a digital organ, piano and other instruments. 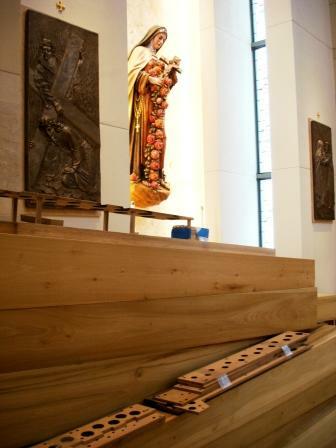 Beginning in the Fall of 2010, the Co-Cathedral will begin offering and expressing praise, thanks, contrition, and petition to God with this magnificent new organ. Martin Pasi and his team at Pasi Organ Builders of Roy, Washington, have been constructing this grand organ since Fall 2006. 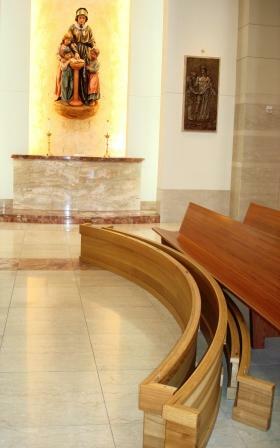 Thousands of custom, hand-made wood and metal parts will be installed and tuned over the next nine months for an estimated in-service date of mid October 2010. With one of two trucks unloaded, the Parish celebrated the regular daily mass at 12:10, offered by Daniel Cardinal DiNardo and Rector of the Cathedral, The Very Reverend Lawrence Jozwiak. 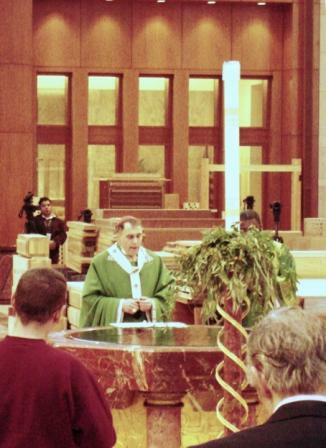 After Mass, the Cardinal officiated at a special blessing ceremony for the organ pipes and their installers. 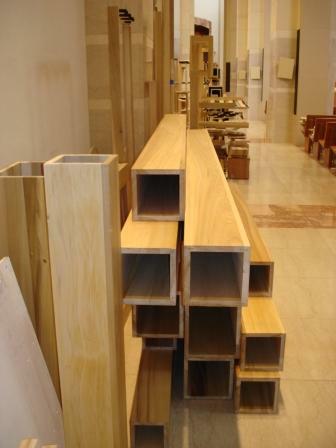 The Pasi installers will have the important job of installing 5499 hand made pipes, 25,000 linear feet of lumber and 11 tons of tin, lead, pipeworks and mechanical action within two 45 foot tall cabinets aside the grand Resurrection Window in the Choir Loft. 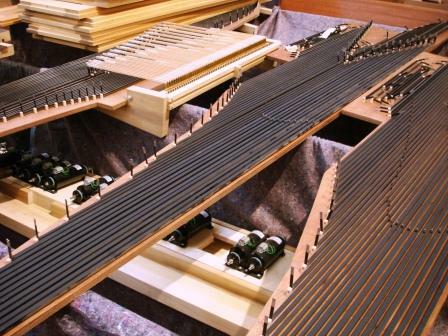 The complete specifications for this grand organ list 75 different stops, 4 manuals or keyboards, and 104 different sets of pipes or ranks, varying in size from as small as ½ inch and as long as 32 feet. A rarity today, the Opus 19 Organ also features a free reed stop Clarinette. 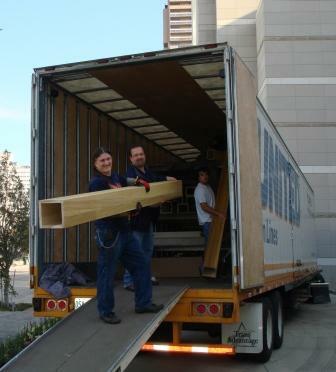 The second truck was unloaded Tuesday. Story written by Greg Haas, Mosaicist & Founder, Studio D’Oro LLC, Houston. Cross-posted over at CVSTOS FIDEI. Saturday, January 9, 2010 \PM\.\Sat\. Many of my favorite pieces of music I associate with the night sky. This is because my father, who was throughout my life a planetarium director, often used his favorite pieces of music as background during planetarium shows. Being the oldest, I frequently had the chance to tag along to planetarium shows, and sit under the dome, listening to my father’s voice. And so now, when I hear something like Ralph Vaughan Williams’ Fantasia on the Theme by Thomas Tallis I find myself thinking of the constellations, and I also find myself oddly misty about the eyes. Tuesday, January 5, 2010 \AM\.\Tue\. I was inspired to transfer my brain goo to the computer screen over the last couple of hours. Here are the results. Here’s to a more fruitful discussion. I haven’t talked extensively about why I rejected atheistic communism and made my way back to Catholicism. There were a number of reasons; being shown the logical and moral bankruptcy of materialism, the corruption I personally witnessed in the movement, the fact that I could never bring myself to really embrace any of the tenants of the cultural agenda, and so on. The idea of fighting for anything in a universe that did not, and could not care about the outcome of human events could no longer captivate me. I suppose some people are able to convince themselves of the possibility, even the certainty, of “goodness” in a reality that owes nothing to consciousness and will; to me, such a belief, no matter how comforting, would be a lie. And I cannot live a lie. Thursday, December 24, 2009 \PM\.\Thu\. Little Drummer Boy is one of my favorite Christmas songs of all time and I surprisingly stumbled across the Celtic Woman version of this song. Celtic Woman is an all-female musical ensemble which I came across on YouTube earlier this year and they are delightfully good! This version of the popular Christmas song has Gregorian chant in it, I’m not sure who scored this, but it works very well with Celtic Woman’s version of Little Drummer Boy. My favorite line of the song is “then He smiled at me“. Thursday, September 3, 2009 \AM\.\Thu\. Fructus ventris generosi Rex effudit gentium. Written in accentual rhythm, it imitates the triumphant march of the hymn of Fortunatus, and like it is divided in the Roman Breviary into stanzas of six lines whose alternating triple rhyming is declared by Pimont to be a new feature in medieval hymnody. In the Roman Breviary the hymn is assigned to both Vespers, but of old the Church of Salisbury placed it in Matins, that of Toulouse in First Vespers only, that of Saint-Germain- des-Prés at Second Vespers only, and that of Strasburg at Compline. It is sung in the procession to the repository on Holy Thursday and also in the procession of Corpus Christi and in that of the Forty Hours’ Adoration. Note: For more information click here.